Finger painting, glue sticks, googly eyeballs, and glitter. It’s no mystery why kindergarteners love art projects so much. If you’re going through art project after project, consider adding a few new ones to your repertoire. 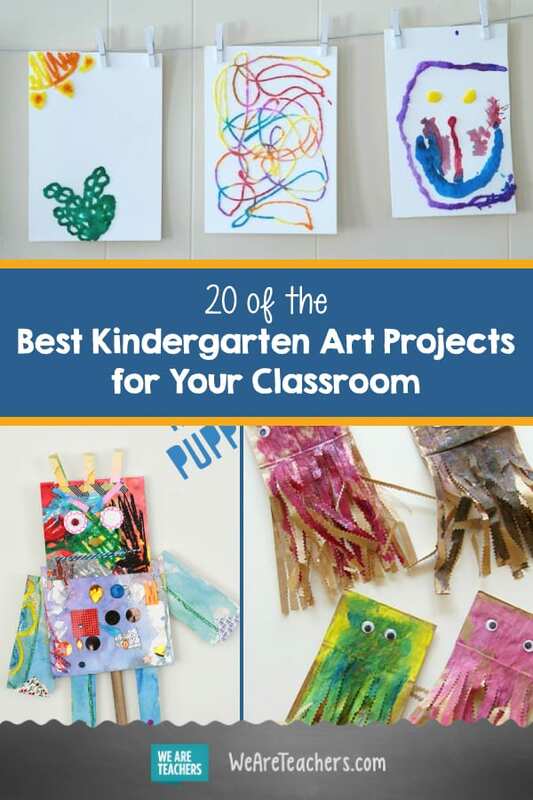 Below are 20 of the best kindergarten art projects. No glitter required! 1. Make a robot puppet. There are few things that kindergarteners love more than finger painting, and one of those things is robots. Combine them, and you’ve got a winner of an art project. Tip: This is a great project for using up loose ends and scraps. So gather your miscellaneous buttons, card stock scraps, and stickers and let your students get to work creating their own puppet. 2. Enhance your raised salt painting with watercolors. This is a spin-off of a another tried-and-true kindergarten art project: glue-and-glitter raised art. As any parent or teacher knows, glitter can be messy. (And yes, I know “messy” is an understatement.) So instead of dumping glitter over glue scribbles, this project uses salt, which is less messy and arguably prettier. Let your students scribble designs with glue (or you could write each student’s name in glue, too). Pour coarse salt over the glue and let it dry. Once dry, use watercolors to paint over the salt. Voila! You have raised salt paintings with mellow watercolors. 3. Embrace wrinkles with this crumbled-art project. If you’ve ever tried to do origami with kindergarteners, you know that five-year-olds are better at crumbling paper than making precise, crisp folds. Embrace that. These crumbled-art projects are actually quite pretty in a rustic way, right? Use clothespins to hang your whole class’s art on a string, and you’ve got a great display. All you need is white construction paper, watercolors, and little hands that are ready to crumble up art paper. 4. Create a tree-inspired, 3-D sculpture. Painting is wonderful, but painting is just one medium that you can use in your classroom. These 3-D sculptures combine two things that kids love: the great outdoors and beads. You only need a few things to get started: beads, clay, and a place to gather sticks. Go on a “field trip” outside to the school playground, and your students can “forage” for the sticks and twigs they want to use. 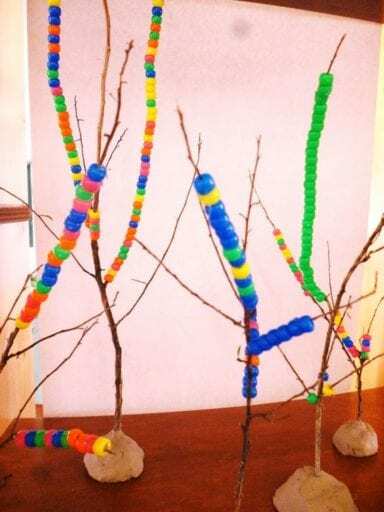 Once back inside the classroom, your little kindergarteners can decorate their twigs with the beads. Bonus: This project builds fine motor skills. 5. Use straws to make these dreamy peacocks! If the final project looks too complex for kindergarteners, don’t worry. This is actually quite the easy project—even for kids who aren’t so artistically inclined. To make those rainbow feathers, you just place a few drops of liquid watercolor onto watercolor paper or white construction paper. 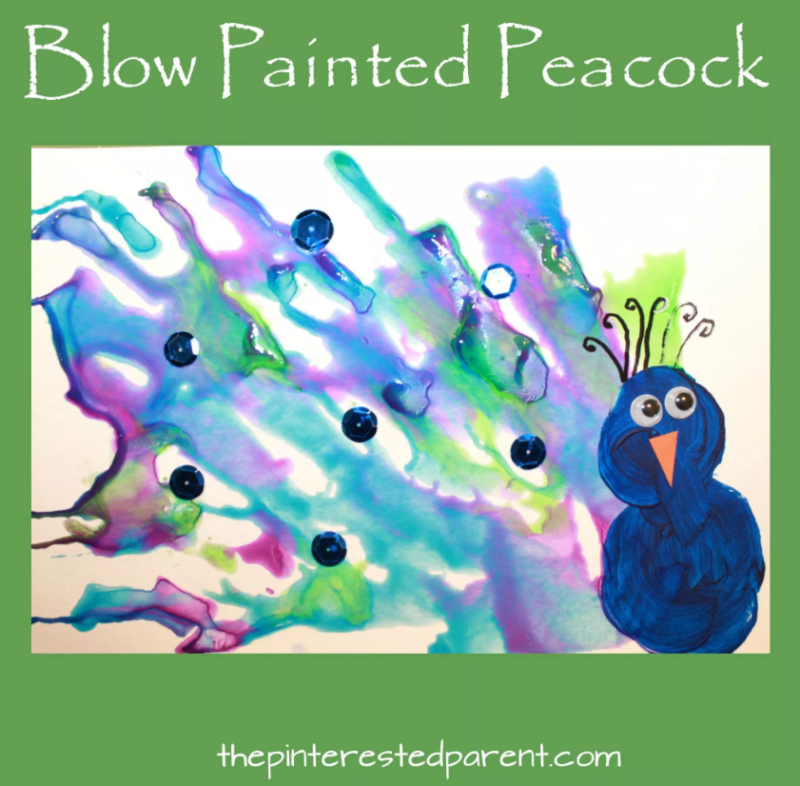 Students then use straws to blow the paint around the paper—no brushing required! Tip: You can help students make circles for the body, or you could let them stamp the body, using large circular painting sponges. 6. No glass needed for this mosaic! Real glass mosaics are best reserved for high school students, but there’s no reason why you can’t introduce the concept of mosaics to your kindergarteners! All you need is corn kernels, paper, and good ol’ fashioned Elmer’s glue. You can also use this project to reinforce the concept of shapes, but really, your little ones can make lots of different kinds of art—self-portraits, animal designs, abstract images, etc.—with this method. 7. Indulge their love of bubble wrap with this “magic” project. Lay (don’t glue) a U-shaped piece of paper over the umbrella to protect it from the paint. Apply paint to the bubble wrap and then have your students stamp the bubble wrap over the whole project. Remove the bubble wrap and the U-shaped paper and—voila!—the umbrella is immune to the rain! 8. Practice the alphabet with these 3-D yarn letters. Are your students working on their letters? Spice up your alphabet lessons with these cute projects. Grab some yarn (the multicolored skeins create the coolest look), glue, and wax paper. Dip the yarn into the glue and lay the glue-drenched pieces of yarn on wax paper. Of course, you’re not limited to letters. This basic concepts works well for abstract art, animals, or basic shapes. 9. Make this mess-free—yes, mess-free—rainbow. Finger painting without the mess? Yes, please! What’s different about this project is that this paint won’t dry out right away, thanks to the secret ingredient, flour. Despite the simplicity of the project, you’ll need to do a little prep work by warming up the flour and water and making a paste. Add your food coloring or watercolor paint to the paste. The colored flour pastes are your materials for this project. Spoon a rainbow of colors into each bag and let those busy fingers get to work! Alternatively, you can just use tempera paint. When your students are done, remove the paper and allow it to dry on newspaper. 10. Move over, Stick Man. It’s time to create Leaf Man. Stick people are so preschool. Your kindergarteners will be making leaf people in no time. You can gather up leaves for your students or let them pick their own leaves during recess. This project can be easily adapted to any season: Beautiful red leaves work well for fall, and flowers and small leaves work well for spring. In winter you can use coniferous needles and, well, sticks. 11. Make crepe-paper art even easier with this one trick. 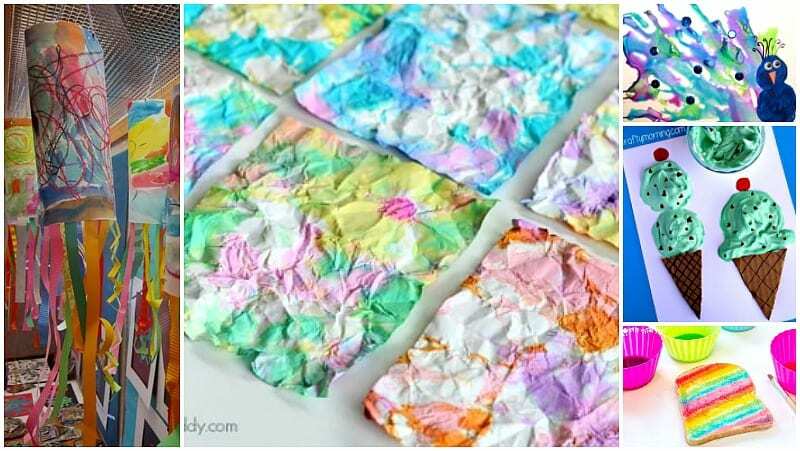 Crepe paper has been a star in kindergarten art projects for years. However, this tutorial comes with a tip that revolutionizes the way you use crepe paper, whether you make this cute abstract design, sun catchers, or shape designs. The big secret? A mini paint roller! Use a mini paint tray and a mini roller to roll on the glue. No sticky fingers, no pressing crepe paper into glue puddles, and no pulling crepe paper or glue globs from tiny fingers. You’re welcome! 12. Create this PAW-some footprint art. This relatively simple project is one your kindergarteners will love. All you need is white tempera paint, black construction paper, and dog (or cat!) figurines. Your students can act out a story while their puppy leaves white footprints all over the paper. The end result is more of an abstract painting, but the process of getting to the end is fun! Tip: Swap out dog and cat figurines for any animals that you are learning about in other subjects. Learning about the jungle? Use figurines of animals that live in that habitat instead! 13. Explore the ocean with these paper bag octopi. Put those scissor skills to good use with these wiggly paper bag octopi! All you need is brown paper lunch bags, googly eyes (the bigger the better! ), and watercolor paint. The process is super simple: Paint, dry, cut, and add eyes! Tip: Use decorated scissors for a more interesting look. 14. These pinch-pot kinder kitties are just too cute. Admittedly, this is not the easiest or the quickest art project on the list, but it might just be the cutest. These pinch-pot figurines are adorable, and your students can choose from any tiny critter: kitties, mice, little birds, etc. This project works best if you have parent helpers or teacher’s aides. I’m a firm believer that kids are more capable than we often assume, and you just might be surprised by the little kinder kitties your students can make! Tip: Read the full tutorial before you head to the supply store because you’ll need special clay (the kind you bake, not the kind that air-dries) and special glaze (not your basic tempera paint). 15. Hungry? Try this edible art project. We’ve all painted on white bread, right? We probably used milk or water and ended up with a gross, soggy piece of bread that we never wanted to eat. Kids Craft Room solves that problem: powdered sugar. Mix liquid food coloring with powdered sugar so you have a thick paste—one that won’t soak through and make soggy bread! What results is a sweet and colorful treat! 16. Learn about symmetry with smoosh art. This is a tried-and-true project for a good reason: It’s fun and slightly magical. Your kindergarteners will love to see how those tiny drops of paint are transformed into symmetrical art patterns. This project also lends itself to a discussion about primary and secondary colors. I’m looking at you, green! 17. Have ice cream year-round with this 3-D project. What five-year-old doesn’t love ice cream? Gather some cheap shaving cream, glue, and paint, and you’ve got the ingredients to make some delicious-looking ice cream. Tip: Make the cones for your kindergarteners and let them focus on the ice cream scooping. You can also make seasonally appropriate “flavors,” like apple pie (sprinkle cinnamon onto the ice cream while it is wet to have scented ice cream). 18. Learn shapes and colors with these kindergarten piggies. These round little piggies give kindergarteners the perfect chance to practice drawing circles. All you need is watercolor paper, a black marker, and watercolor paint. They look even more adorable when they are displayed together, don’t they? 19. Hang these wind socks in your classroom as a fun decoration. Another customizable project, this is a staple for sure! You can create the main body with paint, crayons, markers, or even pastels. Young students love the anything-goes part of decorating the wind sock. This is also a good project if you need to use up random bits of border material, streamers, or yarn. 20. Explore Impressionism with this field of wildflowers. Flowers are a go-to subject. They are pretty, they smell good, and they are common. This flower-inspired project touches on the practice of Impressionism, but in a way that five-year-old kids can grasp. All you need is black paper, chalk for the stems, and paint for the flowers. Let’s hear and see your best art ideas, kindergarten teachers! Share in our WeAreTeachers Chat group on Facebook. Plus, check out these Earth Day art projects.